With the world undergoing tremendous digital transformation, Data Science and Digital Marketing have emerged as the growth engines for 21st century businesses. As a leader in training and education, NIIT, through its online learning platform training.com, has launched several courses to equip today’s working professionals with the skills needed to succeed in a digital first workplace. Courses have been launched in collaboration with industry stalwarts like Indian Institute of Management Calcutta, KPMG, Microsoft, Digital Marketing Institute Ireland and many more. 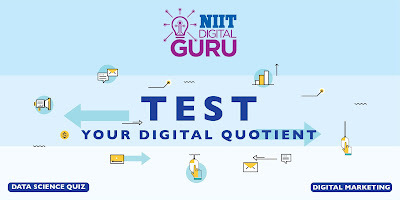 But before you enroll yourself in one of these cutting-edge courses, Test Your Digital Quotient using our specially designed quizzes and you may just win Scholarships up to Rs. 10,000! Hurry up and take the quiz now. Scholarships are valid till 30th April 2018. And don’t forget to share your results with your friends to give them an opportunity to test their own skills and win exciting scholarships.